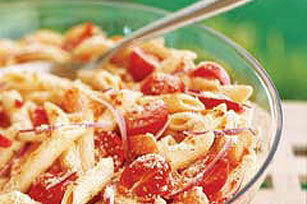 This big, bright, cheery-looking penne pasta salad is made with red onions, red peppers, baby carrots and cherry tomatoes. Cook pasta. Drain, rinse and cool. Place in large bowl. Add onions, peppers, carrots and tomatoes. Stir in Parmesan cheese. Pour dressing over pasta mixture; toss to coat. Cover and refrigerate at least 1 hour. Prepare as directed, using your favorite cut-up vegetables and shaped pasta. Prepare as directed, using your favorite prepared GOOD SEASONS Salad Dressing. For added flavor, sprinkle with OSCAR MAYER Real Bacon Bits just before serving.